As our Indiegogo campaign enters it’s final week I’m posting the promised update… and a request for a tweet! Tomorrow will be Silhouette Secrets’ Twitter day, and your chance to win a digital selfie. Crowd-funded projects gain more visibility the more people mention them online within a certain timeframe. Therefore I’ve been writing to everybody I know and asking them to send a tweet at lunchtime, sometime around 1pm UK time, on Thursday 20th February. I’m told the more noise we can make in a short space of time the better our campaign will perform! 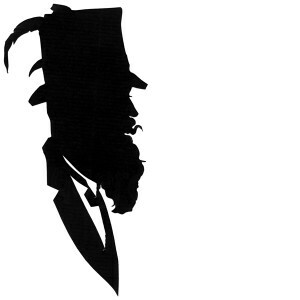 The best tweets will win a digital selfie silhouette. Be creative! I’ll be looking out for your tweets and have a few silhouette gift vouchers to send to authors of the most imaginative comments. To claim your digital selfie you will need to send a profile photograph. And if you really get the bug there’s no reason to limit yourself to just one tweet – feel free to tweet away! The outcome is important (for me at any rate) filming is now underway, a challenge has been laid and the date is set. I am to challenge the world silhouette speed-cutting record, in Houston, Texas, on 25th March 2014 – just over a month away. Your tweets will help me get there! Great Idea – for someone with a high Social profile in my industry sector (with awards such as top 10 UK Linkedin Power Profile) having something different to help you stand out is pretty cool – I may just go and scan my silhouette you did at my wedding now having seen this idea !! You are is impressive! However…would you cut a silhouette of a mucus that one person can have in her/his nose??? Weird question… I know…. Thank you Rovin!!! Yes I would. Might there be a demand for that?